I had the pleasure of meeting Shauna and Dustin last year at our holiday event. They came in to say hello and to begin trying on our engagement rings. They had found our work through Shauna’s sister who is a fellow creative. Shauna played dress up with her favorite rings and we chatted about our custom process. Fast forward to the spring of this year, Dustin reached out to begin the design and creation of Shauna’s ring. With a beautiful round diamond center, just a bit over a carat, we started to work on building the design around the focal stone. 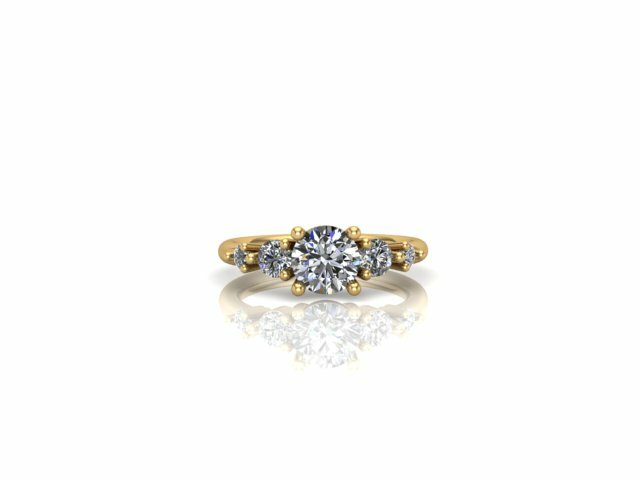 Dustin decided that he wanted to go for a classic, symmetrical look for her ring and we worked through varying stone sizes until we came up with the perfect balance of accenting round diamonds. We chose to have the center diamond offset with a basket prong setting with a gentle curve while the accent diamonds had closed settings for contrast. The center diamond sits a bit higher than the accents to highlight the stone as they graduate in size. I am so happy for you Shauna and Dustin, thank you for letting me be a part of your engagement story! I am looking forward to creating your wedding rings and watching your journey of love grow through time. 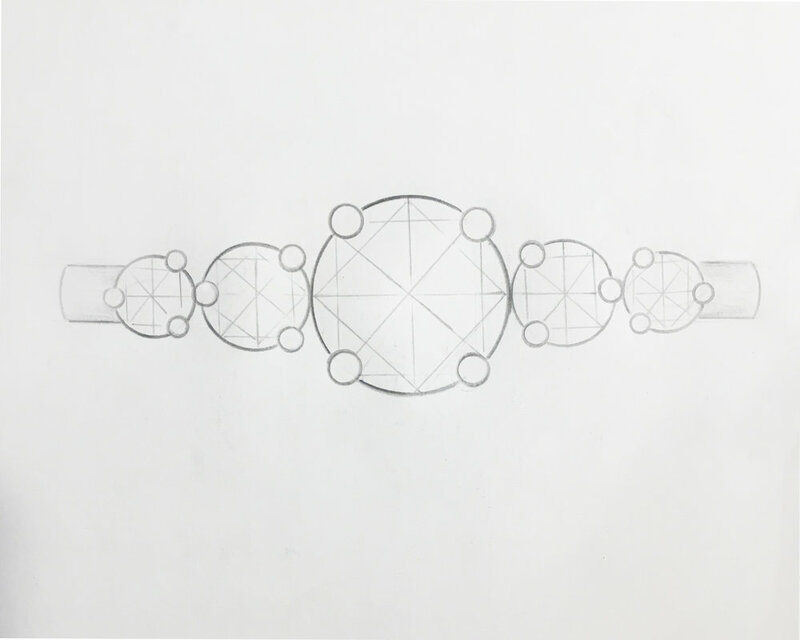 Images below are of Shauna and Dustin’s ring in the design stages. It's been almost a year since my husband Alex and I adopted Penny—time flies when you're in love with your pup! We had wanted a dog for years, but apartment living in Chicago + long hours at work were not an environment that we wanted to provide for a dog. Since I opened the shop in 2015, I knew that I finally had a space that worked well for bringing a dog to work every day and once we had a home, it would be much better. In May of 2017, my husband and I found our dream home, a cabin–like home set back on the property with a lofty pine tree in the front yard. We got settled in quickly and began looking online through various animal shelters in search of a dog. We used PetFinder to search the Chicago area for a small dog and after a short time, came across Penny's adoption picture. You've seen her right? Hard to not fall in love with that face! And we did. We filled out an application and began calling the shelter (maybe too many times) and left several messages about our interest in Penny Dee. The shelter called back and connected us with her foster mom, Laura. We had immense good luck. Penny was being fostered and was on a medical hold (her recent spaying caused her body to experience a false pregnancy). She was adopted a couple days before I called and then returned the next day;the people who had adopted her had another dog and their dog and Penny didn't get along. I was so sad for her to go through that experience, but thankful that because of it, we had the opportunity to adopt her. Because of the transition from Penny being adopted and then returned, the applications for Penny were put on hold and our application made it to the front. A bit of persistence and good timing definitely paid off! 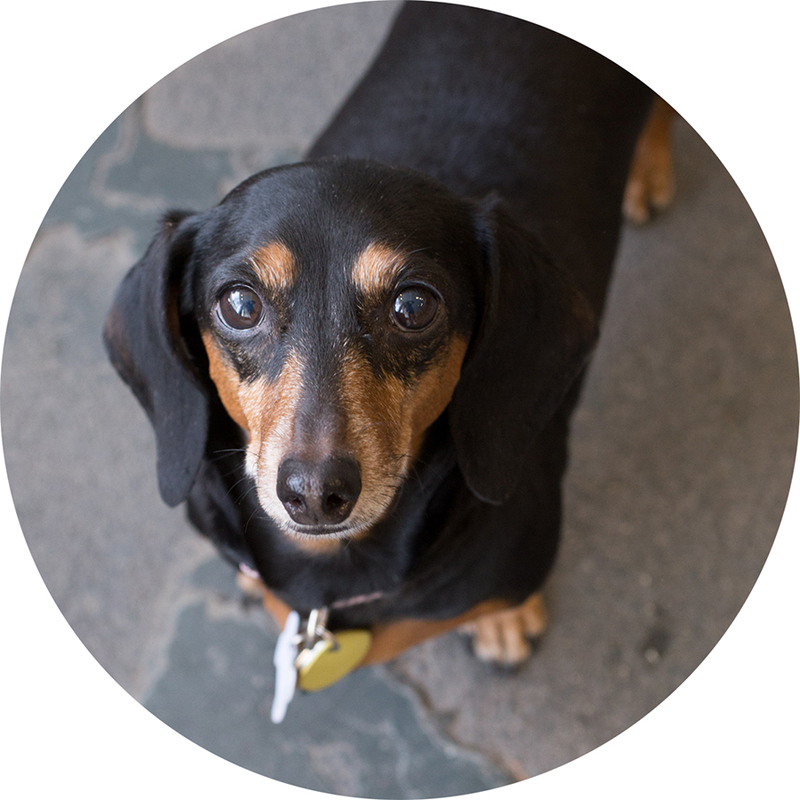 Before Penny was brought to Chicago for adoption, she lived in Alabama with 3 other dogs. The owners were evicted from their home and Penny and her dog siblings were abandoned. A neighbor shot and killed one of the dogs before another neighbor called animal control to pick up the dogs. Penny was underfed and had mothered many litters of puppies. Somehow she is incredibly lovable with people and learned to trust us immediately. The day we met her at her foster home, she was in her little bed with 3 "babies" who she was licking and trying to nurse. These "babies" were her stuffed animals that she thought were her real babies. After she was spayed, her body released hormones that acted like pregnancy hormones. She was lactating and trying to nurse her "babies" and protect them. We approached her quietly with treats and she climbed right into my lap and began kissing me. I fell in love immediately. Alex and I took Penny on a little walk around the neighborhood and laughed as we watched Penny's wiggly little body. We agreed that she was the one and made plans to come back a couple days later fill out the formal adoption paperwork. From the moment we took her home, it's been a whirlwind of love, kisses, and so many cute shenanigans. I can't even imagine that we spent all of these years without her, she is truly a magical unicorn that loves with every ounce of her tiny body. As I write this, she's curled up next to me snoring away! I will be back to share a bit more here and there about Penny and I will also be sharing about her medical story as well. Adopting a dog isn't perfect or easy and there's so much that you don't know about them or their previous life, but it's such a wonderful journey. Here you think you are making a home for a dog in need, but they're really making a home in your heart. As an artist, my mind is always brimming with designs, colors, textures all waiting to be put down on paper. I heard somewhere that being an artist is like having 2,984,203 browser windows open at once. That seems like the constant state of my mind. With that, it seems impossible some days to get all of the ideas out of my mind into some sort of record. My sketchbooks are filled with scribbles and shapey things not worthy of sharing with others, but they're the contents of my mind being recorded on paper for when I need them next. Have you ever had a fleeting thought or idea and regret not writing it down? That's why I sleep with a sketchbook near my bed and my email is filled with late night "to-do" emails to myself so that I remember that thought in the morning. These are all the random things that come into my mind as I'm drifting off and suddenly, I'm aware that I need to have it recorded. There are times I wish I could create faster or that all of my ideas that I love could eventually become a piece of jewelry or art. And then I realize that it is okay. An artist is not a machine meant to churn out pieces without a second thought. Without the time span to fully be immersed in an idea or design, it's easy for the meaning of something to dissolve or for a better design to form. I have realized that it doesn't matter that we are not creating 20 designs a week or that we don't have something new and fresh for every single instagram post. Each piece is carefully considered in its process of evolution. Is it being made just to be made or will it bring beauty or functionality in a way that will spark joy in someone? The process in which our engagement rings evolve is exciting and literally makes me jump and dance around the studio. (I refrain from doing this during our custom consultations haha). There is a moment when you have been looking at 6 different ring compositions for a couple weeks, moving the stones around, taking away stones, adding others, that the design just becomes itself and asks to be created. Out of all of those designs, one steps forward out of the contents of your mind and presents itself as ready to become something. It is bliss to feel a design truly emerge. 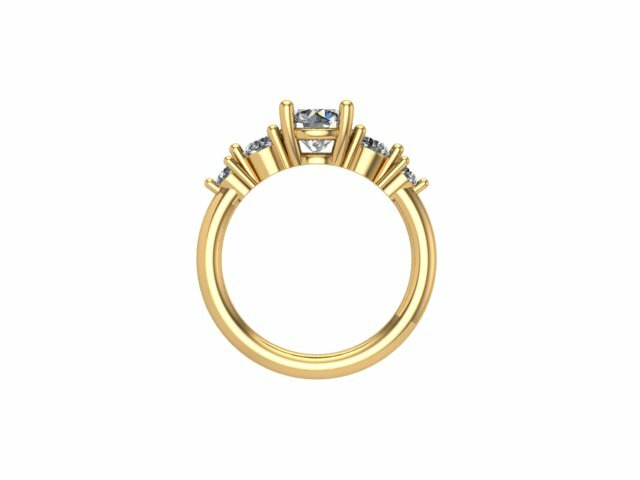 Once a ring composition is ready, it is deconstructed and repositioned in multiple manners to make sure that the design is just right. Anyone who has gone to art school has had a professor that has taken your piece and asked you to turn it upside down or flip things around to make sure that your eye hasn't allowed you to settle. That there may be a better design lurking within the first. This process of designing, thinking, revisiting, redesigning, discussing, and committing to a design keeps the creation process moving forward at a leisurely pace. There is always a group of stones on the bench that are in fluid motion, waiting for that moment where everything is just right for them to become a design. I like this cycle of design because I never feel separated from the things I create or the things I wish to create. I am rarely not in love with a piece because of the time my mind and heart spend with it. Your mind, eye, and heart should always be ready at the same moment for a design. I am proud that each piece we create is never an afterthought, that we don't have a huge library of wedding bands that are just alright. I am proud that each one is made with intention to be beautiful and to be loved. By us. For you.